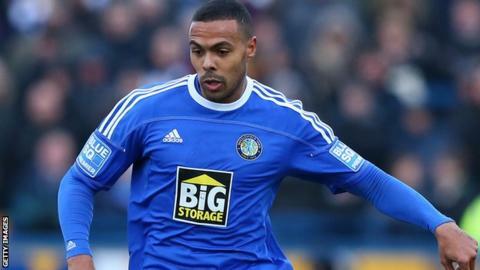 Matthew Barnes-Homer grabbed his fourth goal in three games as Macclesfield Town beat Altrincham to move to within five points of Conference Premier leaders Barnet. Barnes-Homer followed up Saturday's double against Welling by heading home a Scott Barrow cross before the break. Adriano Moke made it 2-0 from 12 yards after good work by Danny Whitaker. And although Kyle Perry ensured a nervy finale with a tidy close-range strike, Macc claimed a fifth consecutive win. Match ends, Macclesfield Town 2, Altrincham 1. Second Half ends, Macclesfield Town 2, Altrincham 1. Attempt saved. Shaun Densmore (Altrincham) right footed shot from the right side of the box is saved. Attempt blocked. Gianluca Havern (Altrincham) right footed shot from outside the box is blocked. Attempt saved. Damian Reeves (Altrincham) right footed shot from a difficult angle on the right is saved. Adam Griffin (Altrincham) is shown the yellow card for a bad foul. Substitution, Macclesfield Town. Chris Holroyd replaces Danny M. Rowe. Substitution, Altrincham. Steven Gillespie replaces Ryan Crowther. Attempt blocked. Shaun Densmore (Altrincham) right footed shot from outside the box is blocked. Attempt saved. Jake Moult (Altrincham) left footed shot from outside the box is saved. Attempt saved. Kyle Perry (Altrincham) left footed shot from outside the box is saved. Attempt missed. Danny Whitaker (Macclesfield Town) right footed shot from outside the box misses to the left. Lee Bell (Macclesfield Town) is shown the yellow card for a bad foul. Foul by Lee Bell (Macclesfield Town). Attempt missed. Tom Marshall (Altrincham) header from the centre of the box misses to the right. Assisted by James Lawrie. Goal! Macclesfield Town 2, Altrincham 1. Kyle Perry (Altrincham) header from a difficult angle on the left to the bottom left corner. Assisted by James Lawrie with a headed pass.